Featuring fun segments with Sia, Pharrell Williams, Maya Angelou, Tori Kelly, Chance the Rapper, and many more! Los Angeles (March 11, 2019) – It’s time for A to Z with Sesame! Elmo and his Sesame Street friends explore every letter of the alphabet in this new collection, brought to you in Sesame Street’s 50th anniversary year. Sesame Street: Awesome Alphabet Collection comes to DVD and digital download May 7, 2019 from Shout! Factory and Sesame Workshop. Kids will love to practice their ABCs with Awesome Alphabet Collection. Highlights include classics “The Beetles Perform Letter B” and “C is for Cookie,” animations, pop culture parodies, and favorite segments from recent seasons. Exploring the alphabet alongside their furry friends is an all-star lineup of celebrity guests. Norah Jones duets with the letter Y, Tori Kelly tries a little kindness, and Pharrell Williams belts it out for the letter B. Maya Angelou stops by to talk hugs, Sheryl Crow helps “I” soak up some sun, and Ricky Gervais tries singing a lullaby to a sleepy Elmo. 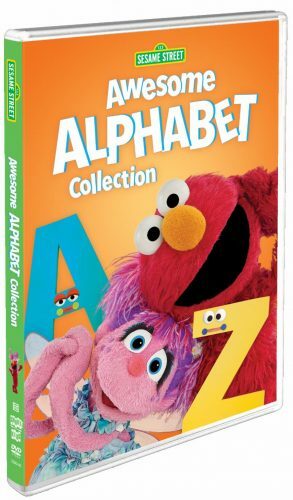 The spectacular A-Z compilation has a runtime of two hours, including Elmo’s Amazing Alphabet Race as a bonus feature. ABC-themed printable activities round out this one-of-a-kind collection. This title is available for preorder at Amazon.com, Walmart.com, and other e-retailers. Awesome Alphabet Collection is being released during Sesame Street’s yearlong 50th anniversary celebration. The anniversary will celebrate the timeless lesson that Sesame Street has always taught: everyone, no matter who they are or where they are from, is equally deserving of respect, opportunity, and joy. Throughout 2019, families everywhere can join their favorite furry friends in celebrating Sesame Street’s past, present, and future with a nationwide road trip, celebrity- and fan-fueled social media campaigns, new social impact initiatives, and a star-studded primetime special that will kick off the show’s 50th season. Fans are encouraged to share their favorite Sesame Street memories across social media this year using the hashtag #ThisIsMyStreet.